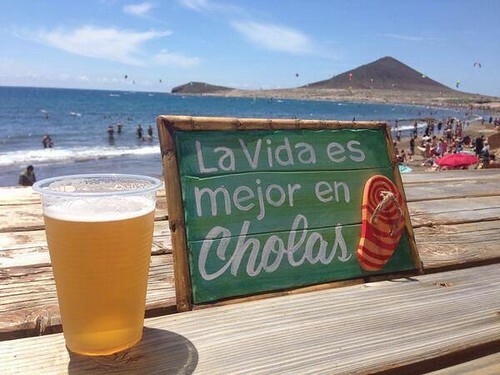 We loved this photo taken in El Medano. 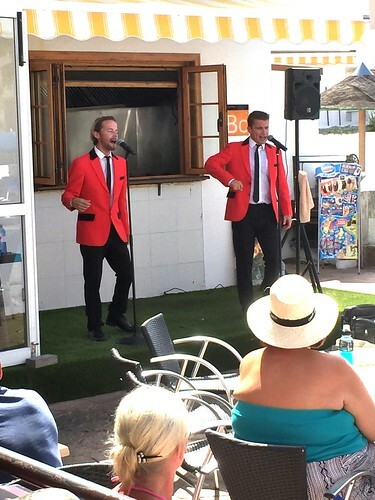 It literally means "Life is better in flip-flops"
We have really enjoyed having entertainment on Tuesday and Thursday afternoons this year. They really have turned into exceptionally well supported Pool Parties. The host for our afternoon entertainment is Gordon Slainey (pictured above). 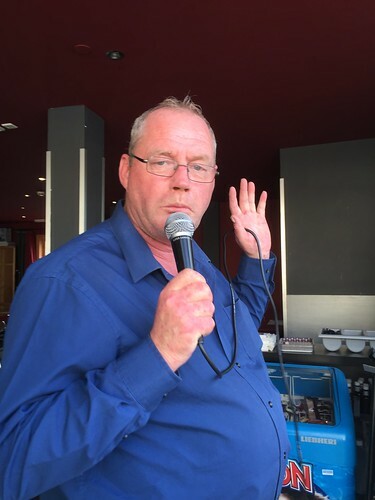 Gordon is a well known DJ from Oasis FM Radio, one of the most popular English radio stations in Tenerife. 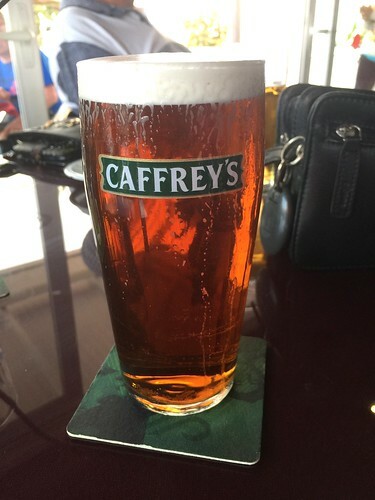 One of our favourite Acts is pictured below. 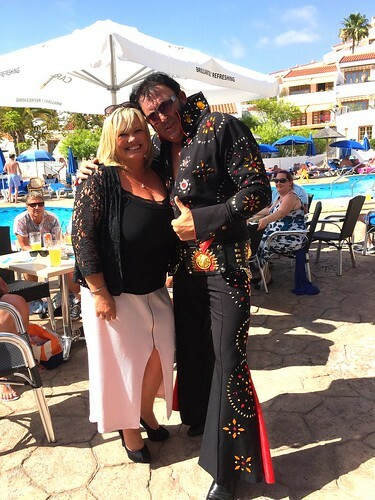 Here is Comedy Elvis 'Leslie Presley' with Jodie Rhodes of Club Olympus. Our Elvis is really Leslie Moore, originally from Bolton in the the UK. His show is certainly worth watching, a great singalong and very funny. 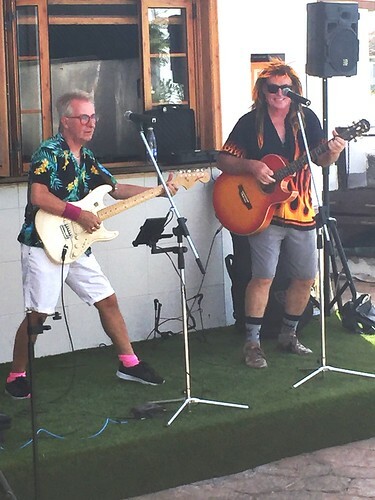 Another fabulous act is the great 70' and 80's Band 'Black Lace' (pictured above). Originally from Yorkshire, Black Lace had mega-hits with songs like Agga-Doo, Come on and do the conga, etc. They go through all their hits plus much more. They are an absolute treat and original band member Colin Gibb with newer member Gordon King are brilliant! A 'must see' is the Jersey Boys tribute show with Pip Brown (left). The boys go through Frankie Valli and the Four Seasons classics and get everybody joining in with their favourite songs. Frankie Valli has a much bigger repertoire that you can imagine and they all get a good airing. You will love it. Shown below is Adam Saint as Rod Stewart. Here he is doing what he does best. Crooning to the ladeeees! A great show and tons of fun. Last but not least featured in the picture below are our ABBA'S Angels. 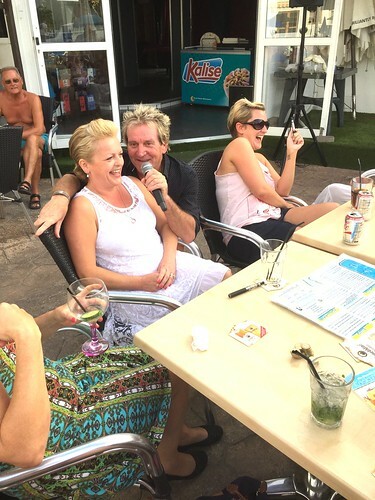 Rachel and Sarah really belt it out at the Poolside Bar and get everybody singing and dancing. 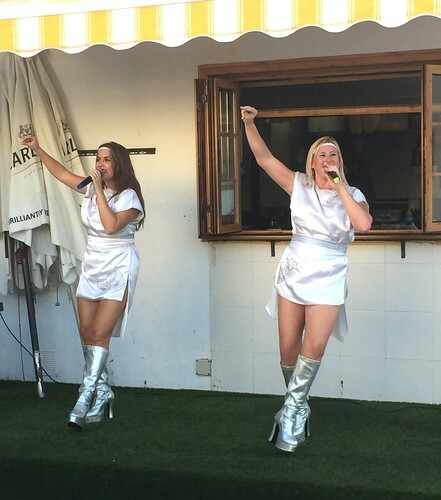 So there is just a quick review of some of the entertainment that we are featuring at the moment down at the resort. After great Winter weather and a beautiful if slightly patchy Spring, Summer is roaring in with fabulous weather. The UK has had some good days but seems to be back to grey skies and drizzle in July. 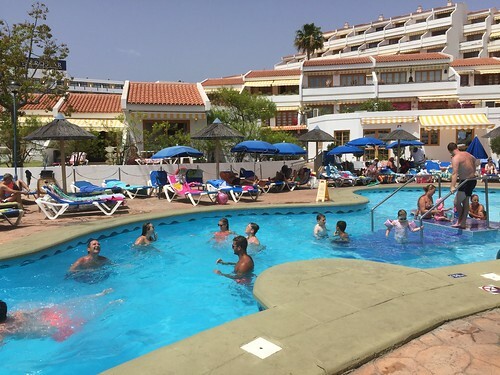 At Club Olympus in Tenerife we are all enjoying the onset of our Summer. The deep blue skies of Winter and Spring have given way to the hazier skies of Summer as you can see below. 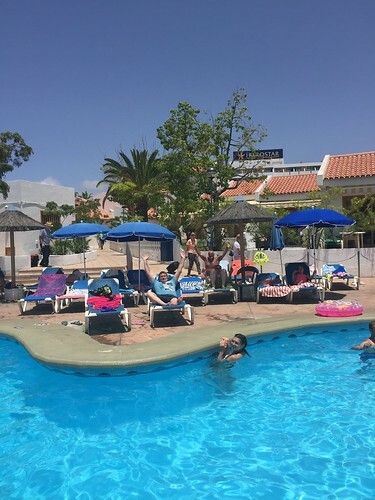 With temperatures 30 plus, the Pool is the place to be! The resort is busy and our Reservation department is telling us that we are pretty full right through to November. 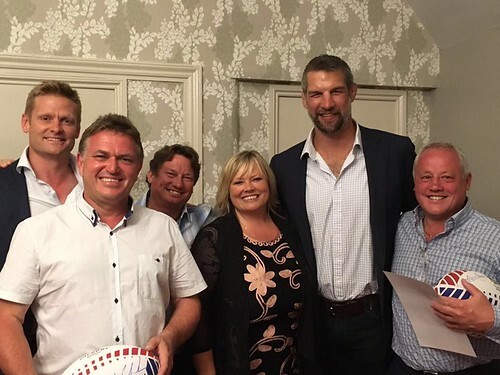 In July we had the Club Olympus AGM which was an opportunity for the Rhodes Clan to be together. 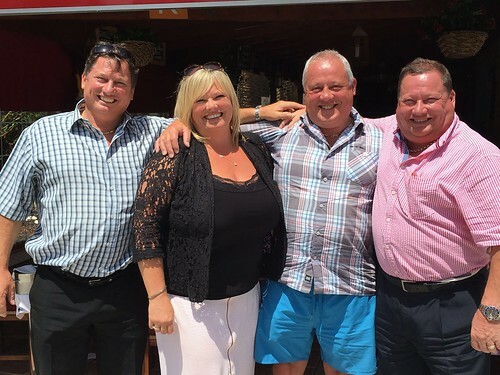 As you know, Club Olympus is a family business run by the late Hedley Rhodes' four kids, shown in the photo taken a couple of days ago on the Resort. Kids! I wish. Anyway left to right we have Peter, Jodie, Tony and Ivan. Peter (or Sedge as he is better known) and I (Ivan) live out in Tenerife whereas Tony and Jodie are in the UK. As you can see, we are not exactly starving! 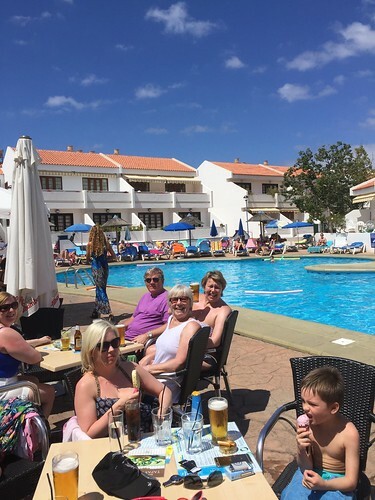 We still try to retain the family feel that Dad insisted upon and do our best to make ourselves available to our Owners, Guests and visitors. 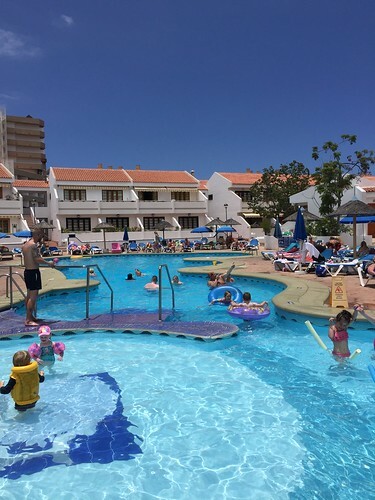 If you need to talk to any of us call (UK) 01535 640050 or (Tenerife) 0034 922 795606. 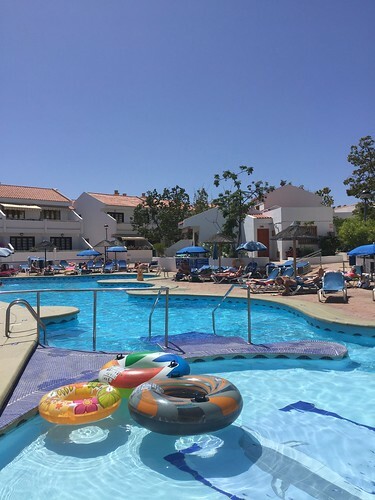 We are looking forward to seeing you all down at the resort during Summer, so get booked, get packed and get your bones down orologi falsi svizzeri here for some serious sunshine! 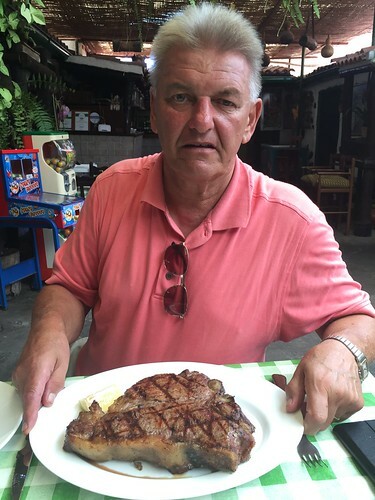 We couldn't leave you without a shot of Ray Karlsen, our In-House Manager about to tuck into a giant Ox T-Bone steak at one of our favourite restaurants 'Era Las Mozas'. He looks a bit serious doesn't he? So let's leave you with a happy sunshine shot!